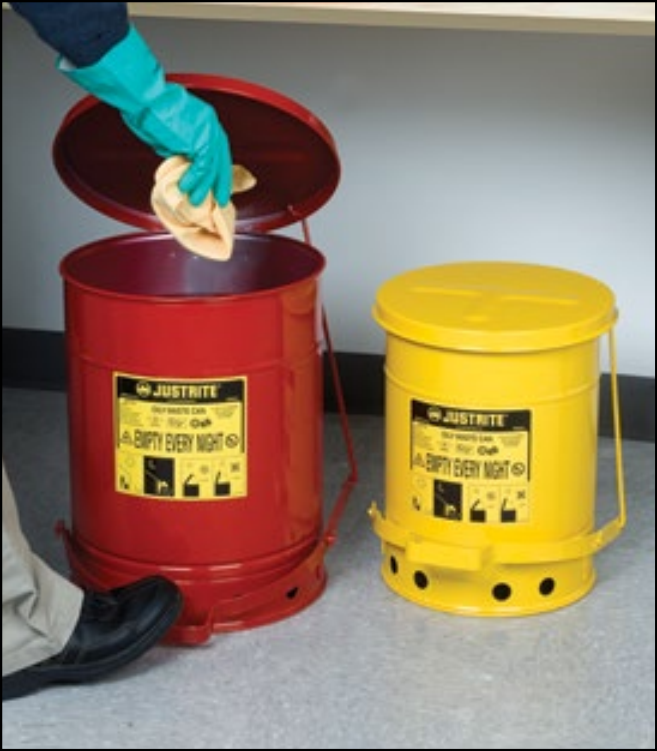 Waste Cans for rags and cloths soaked with solvents, thinners, linseed oil, combustible adhesives and other flammable liquids present a serious fire risk when improperly discarded. Lid opens to no more than 60 degrees and stays closed when not in use, isolating contents from fire sources and limiting oxygen to virtually eliminate the risk of spontaneous combustion. Round construction and elevated base allow circulation of air around can to disperse heat and reduce moisture build-up and rusting. Durable steel construction with a powder-coat finish provides chemical resistance. Approved by FM, UL, and TÜV. All cans carry a ten-year warranty. Oily waste cans include a sound muffling pad inside lid to reduce lid-closure noise by nearly 200% over standard models. Ideal for laboratories or anywhere it is desirable to lessen disruptive noise. Lid opens no more than a 60º angle as required by UL.